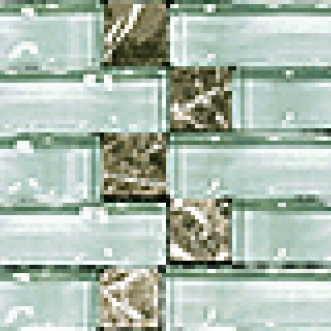 A mesh-mounted glass and marble mosaic. An attractive new style of bevelled glass shapes that are convex, with the addition of small marble inserts. These mosaics are mounted on a (nominal) 12" x 12" mesh sheet. Because of the shape of these Mosaics, they should not be grouted. Therefore, they are not suitable for wet areas such as showers, etc.